Phone calls, emergency alerts, and music are just a few of the reasons that a high quality audio system is vital in automotive infotainment and clusters. Operational amplifiers (op amps) are one of the most common building blocks of automotive audio circuits. Many designers choose to incorporate op amps into their automotive audio circuits in order to increase audio performance. Higher order filters, which can be created through a combination of second order filters, attenuate noise more aggressively than lower order filters. 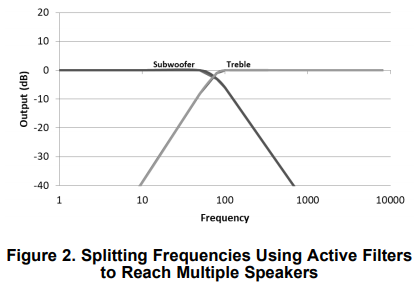 Additionally, active filters remove the chance of unwanted interference with the audio signal. This entry was posted on Sunday, November 18th, 2018 at 1:00 pm	and is filed under app notes. You can follow any responses to this entry through the RSS 2.0 feed. You can skip to the end and leave a response. Pinging is currently not allowed.